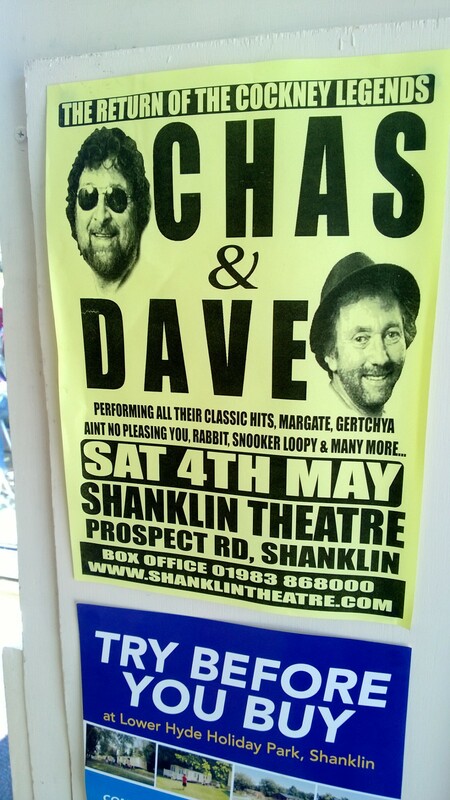 Continueing an occasional series on the greats of Cockney song, Chas and Dave, this poster caught my eye recently on the Isle of Wight. Not sure if this is part of the yearly Isle of Wight festival – setting for the final UK appearance of Jimi Hendrix. Probably. Incidentally there is no truth in the rumour that Dave is not the original Dave. Finally to confirm, the “Try before you buy” slogan above does NOT apply to either Chas or Dave. Payment up front, preferably in cash, is the norm.